It will take another three months to liberate the Iraqi city of Mosul from the Daesh militants if the offensive continues progressing at the rate it is now, President of the Iraqi Kurdistan Region Masoud Barzani said. On October 17, Iraqi Prime Minister Haider Abadi announced the start of a military operation to retake Mosul from Daesh, a jihadist group outlawed in Russia and a number of other states. “We see that they [Daesh] have hundreds of suicide bombers, they must have factories for production of explosives. This would create great danger during the assault. If everything goes well, I expect that it will be possible to liberate the city in three months at the latest,” Barzani told the Bild tabloid in an interview published late on Thursday. According to the official, the Kurdish Peshmerga fighters will not participate in the offensive in the city itself, as they are bound by an agreement with Baghdad and the international US-led coalition. As the Iraqi army and its allies continue their assault against the Daesh stronghold of Mosul, one of the Kurdish Peshmerga commanders has revealed that his men are now only a few kilometers away from the city limits. 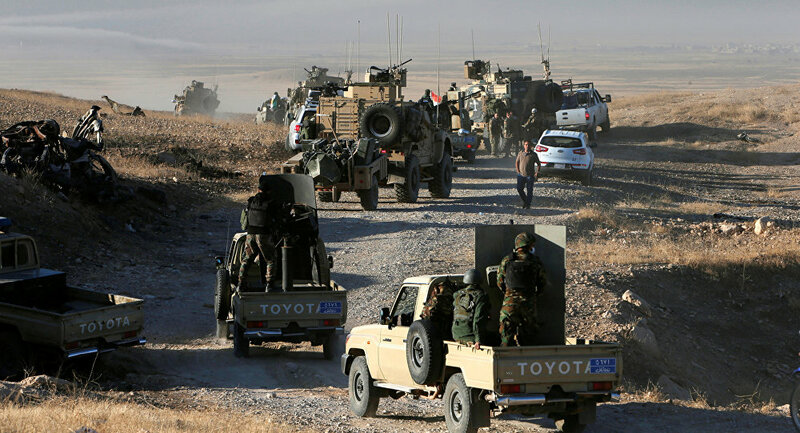 Scores of Daesh (ISIL/ISIS) militants were eliminated by Kurdish Peshmerga forces in the Iraqi province of Nineveh as part of the preparations for the assault on Mosul.Peshmerga General Juku Muhammed Kalahi told Sputnik about how his Kurdish troops had liberated several villages. “Our forces terminated scores of Daesh members during the liberation of the following villages: Al-Sheikh Khamis, Kazkan and Shaquli. Right now we’re one kilometer away from the town of Bartella,” the general said. According to Kalahi, Daesh manpower reserves were depleted during clashes in the province of Nineveh, where the Iraqi military and its allies scored victories in El-Kueir and Al-Khazer several hours ago. Earlier a source in the Iraqi security services told Sputnik that today, on October 17, the military and its allies dislodged Daesh forces from the vicinity of Bashiqa – a town located only 12 kilometers away from Mosul. Since the Middle Ages, Bartella had been inhabited by Arameans, an early group of Christians who used a language akin to that spoken by Christ; its population of 30,000 was roughly one third Catholic and two thirds Orthodox and boasted churches dating back to the 12th century. However, in August 2014, the city residents fled ahead of invading Daesh forces; its last 12 surviving residents faked conversion to Islam and were able to escape the following month, according to AINA News. The conflict between Kurds and Tukey should be resolved by peaceful means, not by the use of force, a member of the Syrian Democratic Forum opposition party told Sputnik. Turkey should resolve its conflict with the Kurds through dialogue instead of through force in the form of military campaigns in Syria, Samir Aita, a member of the Syrian Democratic Forum opposition party, told Sputnik. Ankara announced on Wednesday that Turkish forces, backed by US-led coalition aircraft, had begun a military operation to clear the Syrian border town of Jarabulus of militants from the Daesh terrorist group. 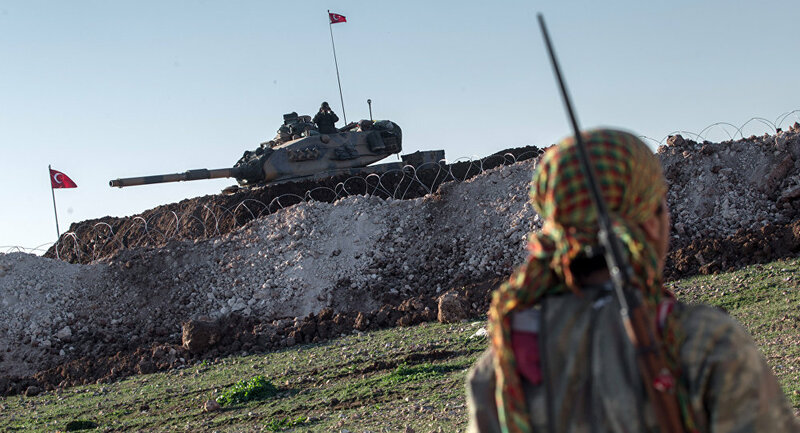 Turkish forces have also turned on Syrian Kurdish groups. On Sunday, Turkish President Recep Tayyip Erdogan said Ankara will continue its operation until the threat posed by Kurdish militants active in the area is eliminated. “The Turkish government should concentrate on Daesh instead of using the Syrian conflict to solve its internal problems. The Turkish government should solve its issues with the PKK [Kurdistan Workers’ Party] through negotiations,” Aita said. 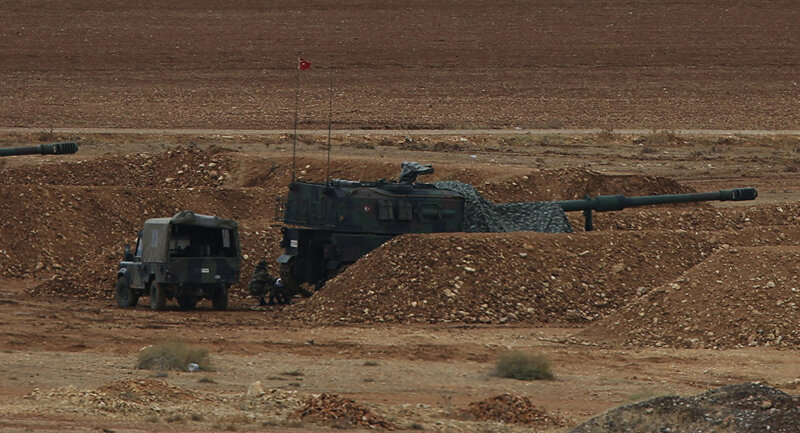 Turkey has been shelling Kurdish militias in northern Syria along the Turkish border for months. Ankara claims Syrian Kurds have links to the PKK, which is considered a terrorist organization by the Turkish authorities. Syria has been mired in civil war since 2011, with government forces loyal to President Bashar Assad fighting a number of opposition factions and extremist groups. Daesh, a terrorist organization outlawed in a number of countries, including Russia, seized swaths of the country in 2014. Kurdish forces have also fought against Daesh, as well as seeking greater autonomy for Syria’s Kurdish-dominated regions.